Video recordings of many Conference sessions (in Hebrew, with several panels and speakers in English) are availale here. 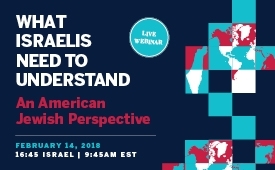 Watch a recording of the webinar broadcast in English: "What Israelis Need to Understand - An American Jewish Perspective." Full program (Hebrew) available here. Program closed with the fifth annual tribute evening in memory of Rabbi Dr. David Hartman, Shalom Hartman Institute founder. Watch a special video of David Hartman from 1987, speaking on the Conference topic. Times of Israel coverage of the Conference featured Dr. Alice Shalvi, a prominent Jerusalem educator, who was a panel participant. This year’s Conference (Hebrew link), the eighth since they began, tackled the challenges facing Israeli and Diaspora Jewry in Hartman Institute style, with honest, in-depth discussions that acknowledge the issue’s complexities but without partisan or ideological shouting matches. The Conference was free and open to the public. Roundtable workshop sessions engaged attendees in adding their ideas to the Conference. Jewish Agency Chairman Natan Sharansky was the keynote speaker. The State of Israel was established as the national home of the Jewish people, and the dominant Zionist and Jewish narrative included the negation of the Diaspora. But the Jewish people today are divided between two centers, Israel and North America, which questions the validity and purpose of the negation narrative. Deep-rooted gaps - sociological, cultural, and moral - between the two centers of Jewish life, threaten the unity of the Jewish people and the place of the State of Israel as the home of the entire Jewish people. How do we create a Jewish Peoplehood consciousness? How do we analyze the relationship between the two Jewish centers? What is our Jewish vision for the connection between the centers? How can we repair and cultivate the connection between the Jews of Israel and North America? What are the Jewish values all of us can share? How should the State of Israel address its responsibility as the home of Jews worldwide? Along with Sharansky, speakers from outside the Institute included Tamar Alperovich, Hagai Elitzur, Raba Shira Koch Epstein (USA), Tehila Friedman, Yael Guri, Yizhar Hess, Rabbi Rick Jacobs (USA), Gilad Kariv, Zvika Klein, Barak Luzon, Rabbi Shlomo Riskin, Prof. Alice Shalvi, Dr. Einat Wilf, and Shai Zarchi. Hartman Institute speakers included Institute President Donniel Hartman, Rabbi Dr. Shraga Bar-on, Prof. Itzik Benbaji, Dr. Ruth Calderon, Chaya Gilboa, Rabbi Avital Hochstein (also President of Mechon Hadar in Israel), Rani Jaeger, Yossi Klein Halevi, Rabbi Dr. Ariel Picard, and Prof. Avi Sagi. The Conference was held at the Shalom Hartman Institute, 11 Gedalyahu Alon St., German Colony, Jerusalem. It ran from 3 pm to 7:15 pm, and was followed at 7:45 pm by the annual session in memory of Rabbi Prof. David Hartman, founder of the Shalom Hartman Institute. Watch a rare recording of David Hartman from 1987, in which he addresses the same issues as were discussed at the 2018 Conference. An English-language webinar, "What Israelis Need To Understand - An American Jewish Perspective," featured Rabbi Shira Koch Epstein, the Executive Director of the 14th Street Y in New York, and Rabbi Avital Hochstein, President of Mechon Hadar in Israel and Research Fellow, Shalom Hartman Institute, and Yossi Klein Halevi, Senior Fellow, Shalom Hartman Institute. Rabbi Epstein spoke some English at the Conference's opening general Session. Rabbi Rick Jacobs spoke via live video from New York during the evening program in honor of Rabbi Prof. David Hartman. See below for details on the evening event. This year marked the fifth anniversary of the passing of Rabbi Prof. David Hartman, founder of the Shalom Hartman Institute, in February 2013. Befitting the Conference theme, speakers addressed the connection between Israel and world Jewry in the teachings of David Hartman. Speakers in this portion of the program were Donniel Hartman, Rick Jacobs (in English), Renana Ravitsky Pilzer, and Avi Sagi.